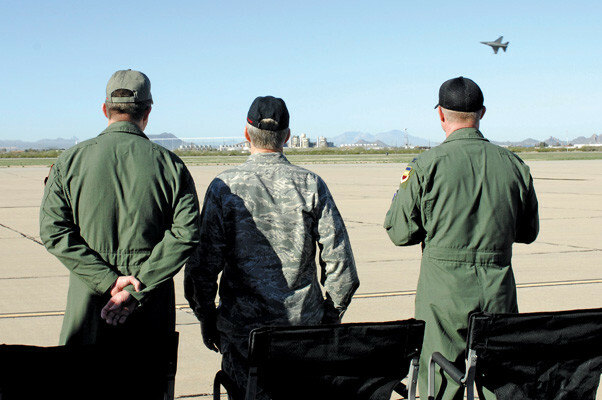 General Hawk Carlisle (center), Commander of Air Combat Command, observers an F-16 Fighting Falcon fly over during the Heritage Flight Training Conference at Davis-Monthan, Feb. 27. Carlisle certified a Viper Demonstration Team pilot, allowing him to fly in future airshows. 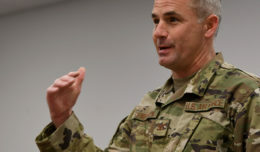 U.S. Air Force Gen. Hawk Carlisle, Commander of Air Combat Command, visited here, Feb. 27, -Mar. 1. During Carlisle’s visit he had two goals, to certify a Viper Demonstration Team pilot, and to speak with the Airmen. 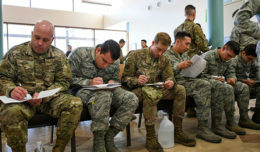 After clearing the pilot to fly in future airshows Carlisle held an all-call where he spoke about what needs to be done to maintain a solid Air Force. 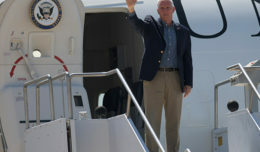 Carlisle also reached out to his Airmen for help. In closing, Carlisle shared his appreciation for the Airmen for all their hard work and dedication to making this the world’s greatest Air Force.